If you have been following this series of posts on translating your New Year’s goal to become a (more) socially responsible business, you’ll have noticed that I have consistently emphasized starting from where you are and setting small, feasible goals based on the resources (money, time, people, energy) available to you right now. I advocate for a lot of reflection up front and opting for small steps because these strategies make it more likely over the long run that you’ll achieve your goals and stay motivated to transform your business into a socially responsible business. What I haven’t discussed yet is what to do when our plans hit a bump in the road and our vision crashes into reality. Ideally, taking small, well-planned steps should minimize the risk of anything going catastrophically wrong as we gradually make our businesses more socially responsible. Nonetheless, sometimes even the best plans get derailed by unforeseen events, or we succumb to the barrage of messages in the popular culture to “play big or go home” so we end up choosing a goal that is a bit too much of a stretch for us and we falter and stumble. As I noted in Chapter 6 of Small Business, Big Change: A Microentrepreneur’s Guide to Social Responsibility, whether the ensuing collision between our plans and reality is the equivalent of a minor fender-bender or a major catastrophe, we can’t afford to remain dismayed or in a state of stunned disbelief for too long; we need to figure out what went wrong and how to resolve the issue so it doesn’t permanently jeopardize our business or our long-term vision. What follows is a quick overview of a few of the various slings and arrows that outrageous fortune can unleash to temporarily halt us in our tracks. While there is no “quick fix” for some issues (it will take more than the equivalent of an over-the-counter pain reliever and a few adhesive bandages to resolve the dilemmas or damage), the following suggested remedies will at least ease the immediate pain and start the healing process. Overwhelm and dejection that give rise to burnout or analysis paralysis. If you started out as a socially responsible business with a market of mostly ideal customers already in place and your business is well-established, count your blessings. You are probably less likely than newly minted socially responsible entrepreneurs to experience pushback either from customers who are more interested in value than values, or from employees who are reluctant to get on board with your socially responsible vision. Whether you are just starting your business, or you have been in business for a few years but have only recently decided to align your business practices with your socially responsible values, it’s highly likely that you have at least a few customers who could care less about your values; they just want the best value at the lowest price. Such customers might be resistant to the changes you want to make if (1) it will result in higher prices or more hassles for them; (2) they lack information about what it means to be a socially responsible business; and/or (3) they suspect your motives for becoming more socially responsible. The first step to responding to customers’ resistance is to make sure you are transparent about your reasons for choosing to be a (more) socially responsible business, listen to their concerns, and keep them informed of the process. If the resistance mainly seems to be a result of a lack of information or a wariness of your motives, this is a perfect opportunity to educate your customers about social responsibility. As Jane Faye of Gaia Noir pointed out when I interviewed her for Small Business, Big Change, “Psychologically, people have a tendency to think [that] any option [which] is new or different will involve extra expense or effort for them than a regular … option. It’s up to you to take the hard labor out of the situation and make it easy.” A second step might be to get your customers actively engaged in the process and ask them for feedback about what kinds of S-R strategies they would like to see you implement and what their tolerance level is for change or possible price increases. As long your plans don’t directly affect prices or service, your value-over-values customers might not be too concerned about your S-R activities. However, if you are planning on making changes (e.g., changing suppliers, changing ingredients/materials, purchasing new energy efficient appliances or fixtures) that are likely to increase your operational costs and you plan on passing along at least some portion of those costs to customers, be sure to do your research first, and think long and hard about whether that cost should be passed along to customers. While you might be able to justify a small increase in price for a change that ultimately improves your product/service and the customers’ experience, you might want to think twice about increasing prices to cover the cost of something that does not directly affect your customers’ experience with your product or service. If you do need to increase your prices, be sure to give your customers a “heads up” as to why the price is increasing, by how much, and when so customers aren’t caught unaware. For some entrepreneurs, it might be their employees, not the customers, who are resistant to getting on board with your vision. The first step to resolving this challenge is the same as that outlined above for resistant customers: Be transparent about your reasons for wanting to become a socially responsible business, listen to your employees’ concerns, and provide them with honest answers about whether the changes you envision might be disruptive or add extra responsibilities to their workloads, either in the short or long term. Be sure not to gloss over concerns by immediately pointing to what you see as the benefits for everyone involved; make sure employees and other stakeholders feel heard and are satisfied that their concerns have been heard before you trying to sell them on the benefits of your vision. Also be sure to outline how you are going to handle disruptions or changes to new processes so it won’t be unnecessarily stressful for employees. For example, if you want to cut out using plastic water bottles or disposable coffee cups, make sure you have a contingency plan in place so that your employees and guests are not inconvenienced when they forget to bring their water bottle or coffee mug from home. As a socially responsible microentrepreneur, there are (or will) probably times when finding the balance between upholding deeply-held values and keeping a close eye on the financial bottom line makes running your business feel more like a high-wire tightrope walk than a cake walk. If you have a generous nature and want to give to others, it can be both frustrating and disheartening if you are not yet at a stage where you can afford to make a donation, sponsor a community event, volunteer your time or skills to a cause, give your employees a bonus or raise, or commit to a long-term donation program (e.g. automatically donating 1% of each sale to one of several organizations). The uncomfortable truth is that you can’t give what you don’t have—whether you’re talking about time, money, or energy. Recognizing and honouring this truth may be awkward or annoying in the short run, but conserving scarce resources in the present just might help you to be financially and socially sustainable business over the long term. Does that mean you have to be like stingy old Ebenezer Scrooge and say ‘no’ to everything? No, it doesn’t; an overly lean pocketbook doesn’t have to translate to being mean-spirited. If you have employees and your revenue covers salaries but not the lavish benefits and extras that you would ideally love to provide, there are still some ways of providing some benefits on a shoe-string budget. Here are some examples from Chapter 6 of Small Business, Big Change: You might not be able to afford to pay extended health care or medical insurance yet, but perhaps you can afford to set aside a small sum of money as a “wellness spending account,” or spring for a gift certificate for a spa day, or partner with some other small business owners to organize seminars on proactive health and stress reduction for employees. You can also find non-monetary options for contributing to your community. For example, you can make in-kind donations of electronics, equipment or office furniture to various local nonprofit organizations. You can also donate your time and expertise to a local cause or project. One caveat to keep in mind when volunteering: Remember that time spent volunteering for a project or cause is time that is not being spent on activities that contribute to building your business and various types of capital. Be sure to set limits on your volunteer projects so you have the time and energy you need to grow your business and fortify its long term sustainability. If your champagne vision of a sustainable business includes having all the latest eco-friendly technology and appliances in a LEED certified building with a living roof, etc, but your bank balance suggests you might just about have enough financial capital to make the best organic lemonade possible, try not to think of it as your S-R vision having gone permanently sour. In a culture that equates success with having the most expensive and latest model of the biggest, shiniest new thing, making do with lemonade might leave a decidedly bitter-sweet taste in your mouth. If it helps to sweeten the deal, think of it as an opportunity to be resourceful about conserving materials, energy and money while also ensuring the long-term viability of your company. Based on the results of your S-R assessment, you may have decided that you really do need to tackle a big ticket item such as a professional environmental audit or installing solar panels. Before you get started, check with your municipal or provincial/state governments and/or your utility company to see whether any of these organizations offer grants or tax credits to small businesses for any green fixes you need to make. Also check to see if you can partner with other local businesses or business organizations, schools or community centres to share resources. If there are no grants/tax credits available and no options for partnering with other organizations, your third option is to budget carefully, choose some simple cost-cutting goals and redirect your savings into a “green fund” to cover the expense of big ticket items. Throughout this series of blog posts, I have emphasized taking small, steady steps to make big changes with a lasting impact. This means setting only one or two goals for a specific period of time and making sure the goals are do-able—in terms of the financial, human and time resources available to you—and an easy win. Trying to juggle too many new behaviours or business processes at one time will only dilute your energy and make it more likely that you will give up if you drop the ball on one the goals. The research on goal-setting behaviours and motivation that I referred to in the first post in this series also supports this argument. If you have taken on too many goals and/or you underestimated the timeline you needed to effectively accomplish each goal, honour your enthusiasm and then give yourself permission to make changes to your project list. Narrow your list down to two goals and then recalculate your timelines so you have a more reasonable time period to do the projects well. Don’t forget to ask for help from others in your business network. At the other end of the continuum from taking on too much too soon, are the individuals who still feel paralyzed by too many options and don’t know where to start. If you are feeling overwhelmed by too many choices and you are second-guessing yourself on every decision, it’s understandable if you feel like giving up before you even get started. Before you turn your back on your vision, take a deep breath and remember this: you don’t have to do everything. Not all of the suggestions given in this series of articles will apply to your business, so that might help to narrow down the choices for you. You could take the list of actions, randomly pick one, and take that first step forward. If you are struggling to choose even one action, you may want to step back and ask yourself if there is something else going on that is creating anxiety around your decision to make your business more socially responsible. If intentions and plans to transform your business have been derailed courtesy of clashing demands on your time and resources or by competing expectations, take heart. If you have come to the realization that, at least for the foreseeable future, your business simply does not have the resources to support a comprehensive S-R overhaul, it’s understandable that you might feel dejected at the thought of having to put your entire project on hold. It’s important to understand that temporarily postponing your plan because you don’t have the resources to execute it well is not abandoning your plan. Knowing when to pause, regroup and recalculate is the wise course of action that will help to reduce the likelihood of failure over the long run. Several of the microentrepreneurs that I interviewed for the book emphasized the need for patience and waiting until you have the funds so you can do it right the first time. As I have also mentioned throughout the series, becoming a more socially responsible business is not an all or nothing outcome. If you don’t have the resources right now to do everything that you want, use the down time to do some more planning (or raising funds if that is what’s required). You could also scale the project back to a level that is manageable and focus on implementing less resource-intensive strategies during the down time. Have I missed anything? Do readers have any pearls of wisdom or strategies they’d like to share in the comments section? What else would readers like to learn about becoming a socially responsible microbusiness? Chambers, Susan. Small Business Big Change: A Microentrepreneur’s Guide to Social Responsibility (San Francisco, CA: Night Owls Press, 2012), p. 199. Chambers, Susan. Small Business, Big Change, p. 201. 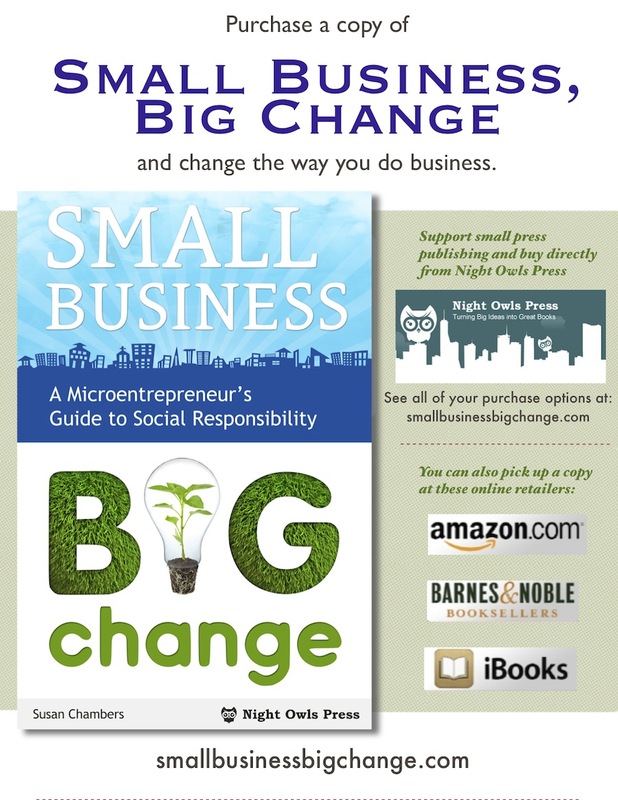 To be entered in the drawing, buy a copy of Small Business, Big Change. Forward your order receipt to admin@nightowlspress.com by February 14. Put “Change Your Business, Change the World” in the subject line. Purchases must be made between January 9 and February 14 to qualify. Paperback purchases receive 2 entries, e-book purchases get 1 entry. Drawing will take place on February 15 and winners will be notified by e-mail.